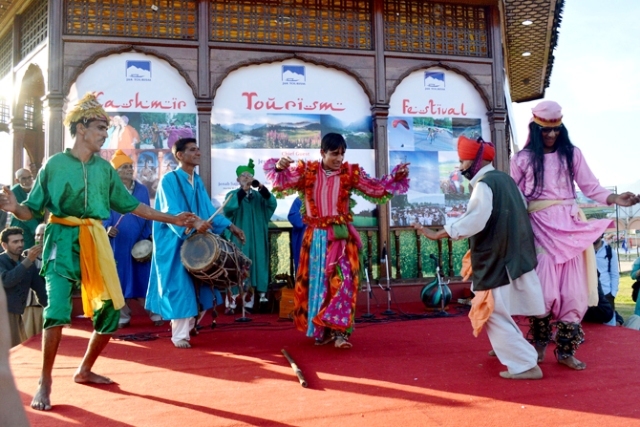 The culture and festivals in Srinagar today are rooted in a rich blend of imperial influences, from the Mauryan roots of its beginnings as Parvasenpur two millennia ago to the Islamic touches of the Mughals later on. This is among the oldest cities in the country, which means that it has had so many influences coming into contact with it over the years that a particular brand of culture specific to it yet drawn from many other cultures has been developed already. As in many other parts of India, Islam is present here and has written itself into the city’s inhabitants as well as buildings. There are several mosques in Srinagar, including the noteworthy Jama Masjid of the city. Christians and their churches are present too, as are the Hindus, of course. Srinagar has several places, in fact, that are ripe with religious significance-say the shrine of Kheer Bawani, for instance, where the natural spring’s water actually changes colour and is said to prophesy in such a way the future of the Kashmir region-and this has a profound effect on the character of the city as well as on its festivals. Probably the most famous festivals in Srinagar are one celebrated by the Hindus and Muslims. Note that the latter celebrate Navroz here, usually for about 9 days. Other festivals worth noting would be Makar Sankranti (in the middle of January, specifically a festival of fertility where couples pray and hope for children), the Harvest Festival (which is actually celebrated in many other places in India too and which has traditionally been considered an auspicious time for weddings) and Ramzan (better known as the Arabic “Ramadan” by Westerners, a time of fasting and deep prayer). One especially interesting festival in Srinagar worthy of being noted separately would be Urs, a festival native to the Kashmir region and traditionally held during the days that certain saints of Islam died: what is so curious about this festival is that in Srinagar, nearly all the faiths participate in this festival. From the Hindus to the Sikhs, you shall see Srinagar locals celebrating Urs once it comes around. Another thing worth noting about Srinagar’s culture is that it is steeped in beauty. Handicrafts and traditional arts of the Kashmir are alive and well here and are yet being practised today. This is why many people who come to the city end up falling in love with the products of the local artisans and end up weighted down by them once they leave. Pashminas, chainstitch rugs, papier mache pots, carpets, and the like are abundant in the bazaars and markets. Beyond that, you may well end up seeing a number of performances of traditional arts such as Bhand Panther and Hafiz Nagma. If you happen to run into a marriage ceremony in the city, you may want to check out if they are going to do Rouf or not: this is another of the Kashmir’s traditional dances for celebration. Truly, the culture and festivals in Srinagar are wondrous to behold, and must certainly be experienced for oneself.